There is no central authority that defines Deist beliefs and practices, as is the case -- for example -- in the Roman Catholic church. Thus, Deists vary considerably in their beliefs. One core belief shared by essentially all Deists is that God created the universe, established its natural laws, "wound it up" and then disassociated himself from creation. Some commentators refer to Deists as believing in a God who acts as an absentee landlord. A few Deists believe that God still intervenes in human affairs on rare occasions. However, most believe that God is wholly transcendent. God does not listen to or answer prayers; God does not intrude in nature by creating miracles. They believe that the only paths towards knowledge are logic, reasoning, and observation. They respect portions of the holy texts of other religions, like the Torah, Christian Scriptures (New Testament) and Qur'an. However, they believe that these books are errant because they were written by humans; they do not believe that any of these books can be considered inerrant, inspired by God or to be the Word of God. They believe that miracles do not happen. The "world operates by natural and self-sustaining laws of the creator." 1 That is, the world continues to function under the same laws that God initially established. They do not view God as an entity in human form. God does not have human feelings like love, hate, anxiety, happiness, etc. Deists hold diverse beliefs concerning the exact nature and attributes of God. Some believe that God has no interest in humans and may not even be aware of our existence. They believe that one cannot access God through any organized religion, set of beliefs, rituals, sacraments, or other practice. God has not selected a chosen people (e.g. Jews or Christians) to be the recipients of any special revelation or gifts. Deists generally deny the existence of the Trinity as conceived by Christians. They generally view Jesus as a philosopher, rabbi, teacher and healer, but not as the Son of God, or as a member -- along with God and the Holy Spirit -- in a Godhead. Their beliefs are similar to those of the Jewish Christians -- the initial Christian movement centered in Jerusalem and led by James, the brother of Jesus. Most Deists view God as having left his creation behind. Thus, prayer makes no sense to them. However, some pray to express their appreciation to God for his works. The latter generally do not ask for special privileges, try to assess the will of God through prayer, or ask God to perform miracles. Most Deists do not actively evangelize the public. The words "A new cycle of the ages - Deism" means that as the religion and philosophy of Deism gains greater acceptance, Deists believe that negative elements of the previous cycle -- such as fear and superstition-based religious beliefs -- are vanishing. The uncompleted lower portion of the pyramid symbolizes all of the work and progress achieved by previous generations of humanity, and that we still have important work remaining to be done. The separated top part of the pyramid represents humanity's potential to be sought after. The bright burst of light represents the light of reason and God -- the Designer of both life and reason. The reference to Nature's God highlights that Deists have faith in "Nature's God" rather than in the writings of holy books written by humans. The same Deist expression appears in the U.S. Declaration of Independence where it is often mistaken as a reference to the Christian deity. A similar symbol is found on the back of the American one dollar bill. It is used by the Masonic Order, and appears at the top of the center towers of the temple of The Church of Jesus Christ of Latter-day Saints in Salt Lake City, UT. 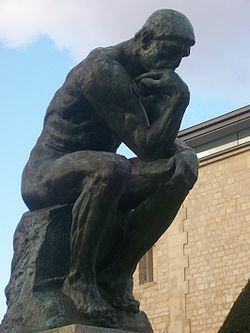 "The Thinker," perhaps the most famous sculpture by Auguste Rodin, is often associated with Deism. Its outline appears in the logo of the Deist Alliance. 8 We have not seen it proposed as a symbol. A sine wave: This is a mathematical function found widely throughout nature. "The Christian Deism Symbol," at: http://www.christiandeism.com/ The home page itself does not appear to be online. John Earwood, "The Elusive Deity of Deism. 'What in god’s name do you believe? '," 2005-FEB-03, at: http://godvsthebible.com/ This is a PDF file.